“The white man broke every promise except for one. They promised to take our land, and they did,” these are the words of war chief and holy man Sitting Bull that, more than 100 years later, seems to still echo across the plains of the Dakotas. The bitter cold and recent decision from the U.S. Army Corps of Engineers that put a halt to the construction of the Dakota Access Pipeline, (DAPL) may have sent some protesters packing, but not all of them. The camp—today a community of staunch, unwavering and passionate like-minded people—is bracing for what’s to come. Whatever that may be, some of the Veterans I spoke to said. Even after president-elect Donald Trump, who supports the construction of the pipeline, takes over the reins at the White House. The protesters, those willing and cleared to speak to the media, made their intent very clear. They’re not budging until all Energy Transfer Partners, L.P. equipment, still at the ready to proceed in constructing the 1,172 mile pipeline under Lake Oahe, is removed from the disputed site. The location of the All Nations Camp, as its been dubbed by its members and the locals, is in Cannon Ball, SD. A short distance drive up the road passed Prairie Knights Casino. The camp sits between Oceti Sakowin Camp and Sacred Stone camp, immediately after crossing the Missouri River. For many of the protesters, the casino provides some relief from the camp and the bitter cold. As you near the camp site, you can’t help but feel a sense of amazement and awe of the tenacity and strong will of the human spirit. These are the first Americans. Fighting to maintain their culture and identity, still. “Fifteen or twenty thousand years ago, at the end of the fourth great Ice Age or before, the first men reached the New World. These were the ancestors of the American Indians. They came in small bands of several families, following the hunters who got them food. Straggling out of Asia in pursuit of game, they had no notion of the two enormous continents that lay ahead of them, empty of men,” states a passage in The Ghost Dance, The Origins Of Religion, by Weston La Barre. This understanding carries enormous significance when adequately judging the on-going protest against the pipeline, despite the multicultural distinction of its members, these people have taken on a David versus Goliath like combat. And, they’re unsure of what lies ahead. Tribal Flags of all kinds and meanings guide your path into the snow covered camp shrouded with howling winds and flapping tarps begging for mercy. Tents, Tepees, RV’s and even basic plywood structures that serve as a much needed refuge from the weather, seem to stand at attention as a sign of opposition against an unmatched power, and an unforgiving changing world. Man’s need and insatiable appetite for oil and other riches that help advance and sustain our modern society reigns supreme in these vast lands, fought fiercely for, and belonging to the first Americans, the Lakotas’. “…every year the first entry of man into the New World seems to be pushed deeper into antiquity,” states La Barre in The Ghost Dance. And, to put the DAPL protest in historical perspective, one can’t help but find the irony and sad truth of this observation. The Lakotas’ aren’t new to these kinds of constrictions, but it’s hard to argue that the on-going struggle for basic human and land rights is steadily pushing them further away from their ancient past, as the world around them tugs away at what remains of their land and culture. A recent article in the Smithsonian titled, Grant’s Uncivil War by Peter Cozzens, states fittingly at this moment in history concerning this on-going issue: Under the Fort Laramie Treaty, the United States designated all of present-day South Dakota west of the Missouri River, including the Black Hills as the Great Sioux Reservation, for the Lakotas’ “absolute and undisturbed use and occupation.” The treaty also reserved much of present-day northeastern Wyoming and southeastern Montana as Unceded Indian Territory, off-limits to whites without the Lakotas’ consent. The article goes onto say that “most Lakotas’ settled on the reservation, but a few thousand traditionalists rejected the treaty and made their home in the Unceded Territory. Their guiding spirits were the revered war chief and holy man Sitting Bull and the celebrated war leader Crazy Horse. These “non-treaty” Lakotas’ had no quarrel with the wasichus (whites) so long as they stayed out of the Lakota country. This the wasichus largely did, until 1874.” That’s when Major General George Armstrong Custer received his marching orders to scout land for a new Army post, according to historical records. Fast forward 142 years later, it’s clear to see who got the raw deal of the Fort Laramie Treaty. During my stay in Bismarck, ND I got a chance to speak to an official who asked to remain anonymous. He made the argument, sitting next to his wife and a family friend they jokingly didn’t want to claim as such, that the protests may have started as a fight for mother earth and clean water, but says that it’s taken a political turn for another shot at pushing for land rights. “It’s about old rights. That’s what the protest is really about,” he said. “Pipelines are everywhere! Why is this one so important?! It’s a lands rights issue and the rule of law has been violated,” he said. He asserts that the protesters that have come from across the country and Canada are not being good guests of the two bordering states. The group shared stories of poaching, menacing and trespassing on farmers lands. He said the cost to maintain order and safety doesn’t come cheap. “North Dakota has paid 17-million so far to deal with the protesters,” he said. The official also stated that the coverage of the protests have been biased and that goodwill between the Sioux and locals have been damaged because of the protests. “Friends are torn apart,” he said. 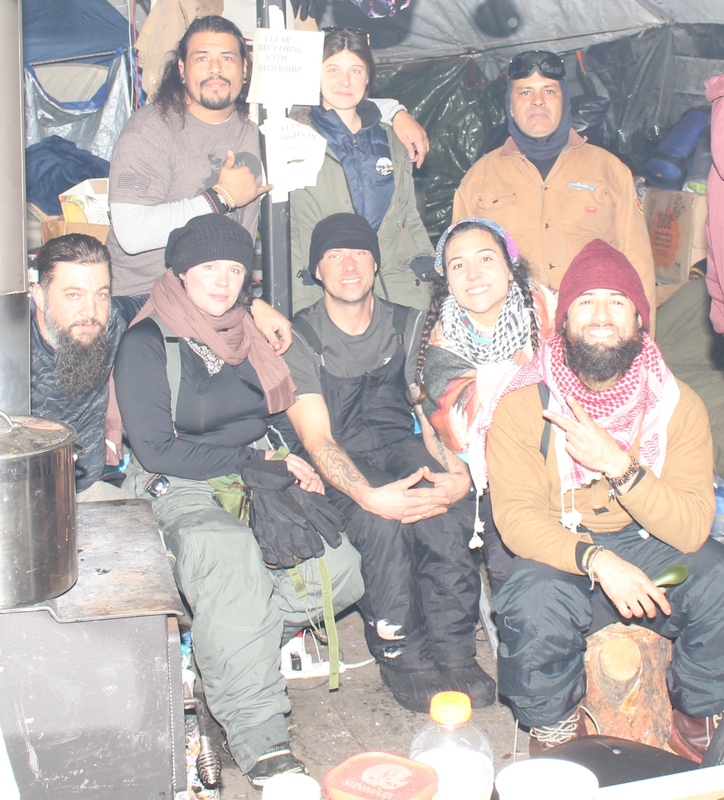 Speaking to some Veterans at the camp, the consensus was that the recent visit from other Veterans led by Wesley Clark, Jr. caused more confusion and discontent than anything else it set out to do. Some of them believed that there were political motives involved in Clark coming to the camp. “He even rode on a horse up to a hill,” one of the “Old Vets” claimed. The Veterans, still dug deep into this struggle, refer to themselves as “Old Vets” to distinguish from the newer arriving Veterans that have since left. One thing was made clear. They’re not budging until the Sioux Nation asks them to leave. When asked about getting paid to maintain the protest, the group collectively took offense to the question and said, absolutely not. However, the question merit asking as it was brought up by some in Bismarck, including the official that spoke anonymously, as a reason behind the on-going protest at Standing Rock. My evening at the camp ended at the Dome, appropriately aired and warmed with burning wood and the smell of sage. It’s a dome structure in the middle of the camp where camp leaders meet to discuss issues, like change of perspectives, how to improve camp life, the forming of clicks and Lakota virtues. The members form a big circle and take turn speaking, adhering to a respectful exchange, and ending with a prayer. It is necessary to recognize both sides of the situation. It’s hard to argue with the official who says it’s time to merge cultures and collectively contribute to our greater American society. However, the root of this pattern of conquering land from the first Americans, at any cost, runs deep. The wounds are still raw and hard felt. How the Trump era of politics and dealings will impact this struggle is anybody’s guess, but it behooves one to remember that the strength of America is rooted in all the people of this land. The first, the old, and the newcomers. This entry was posted in Archives, Culture, Hot Topics, Politics and tagged dapl, epa, epluribus america, jeanette lenoir, lakotas, pipeline, souix indians, standing rock on December 15, 2016 by jlenoir.